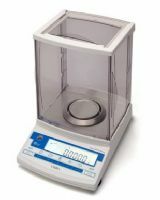 Oneweigh's selection of analytical balances are ideal for people working in a laboratory, industrial or educational setting, measuring at 0.1mg, looking for affordable alternatives at a third of the price or less of some other well known brands . Featuring a protective enclosure or draft shield, to reduce the influence of dust and air flow on the weighing results our 4 place balances are supplied by reputable global manufacturers, allowing us to offer you the best best pricing, with in most cases, next day delivery. If this range of analytical scales is is of too high resolution for your needs take a look at our hugh range of laboratory precision balances here.